The second post of the day!!! 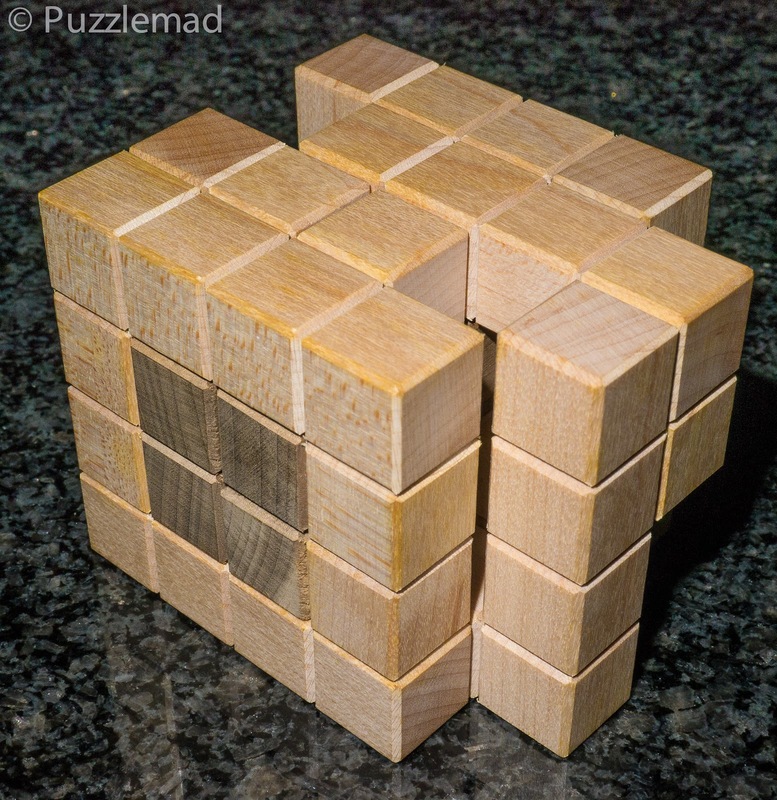 I just had to get this off my chest - it has taken me a VERY long time to solve these puzzles! 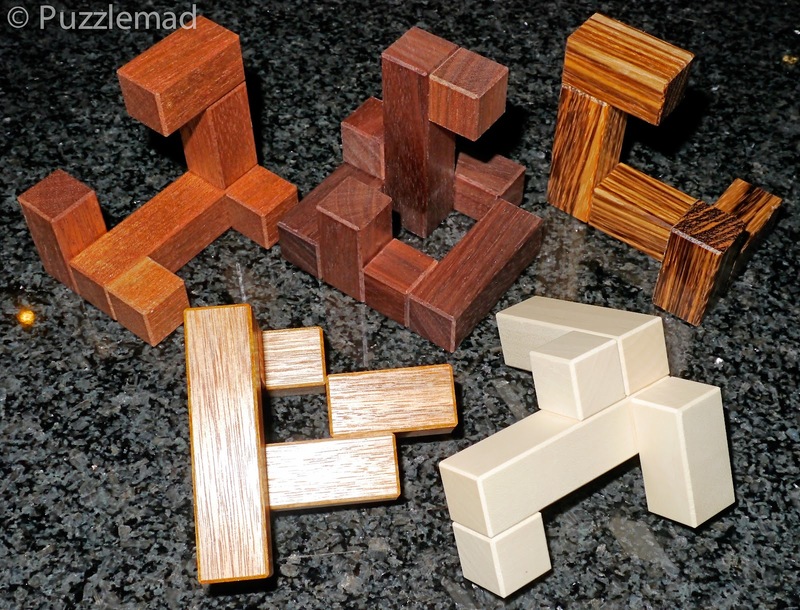 None of these puzzles are new - in fact I have had them for an embarrassingly long time! 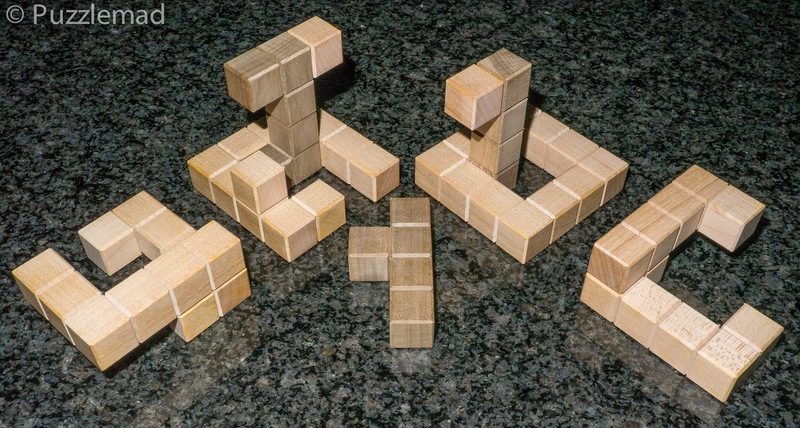 This collection of cubes/interlocking solids have an interesting history. They were bought at separate times and from different craftsmen yet share a common theme. 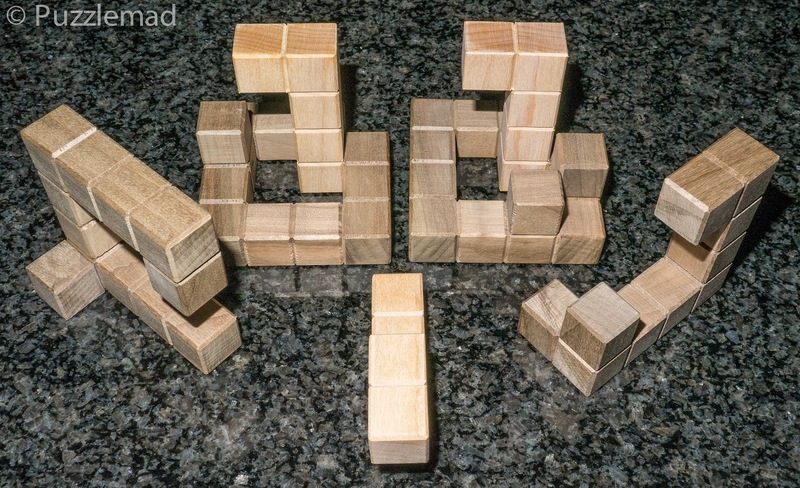 From left to right we have Lock-Y-Cube, Disjointed/Accordion Cube and Lock-N-Cube. This particular version was made by the amazing Eric Fuller and sold in Feb 2012 - he made it from beautiful woods (Holly, Canarywood, Sapele, Zebrawood and Walnut). The interesting thing about it that makes it fun is that all five pieces move along the same axis, yet nothing seems to want to come apart. This is a very devious and fun design that stumped me for quite a while - it requires you to notice something rather unexpected before a piece comes loose. After that, it all comes to pieces. Reassembly is not too hard as long as you remember the order and position - there are several ways a couple of pieces would appear to go but only one is correct. 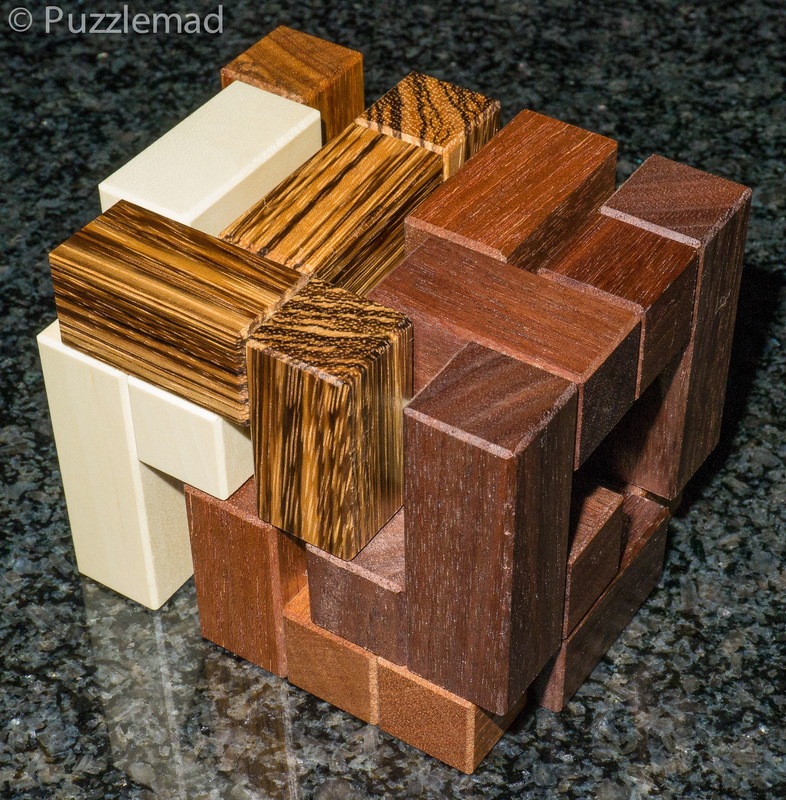 Eric makes such gorgeous puzzles!! The other 2 cubes came to me in a more round about fashion. Allard blogged about the series in May 2012 and I asked him to bring them for me to play with at the 6th Midlands Puzzle Party. He duly did this and during a very long day of puzzling I completely failed to solve either of them despite trying for nearly an hour! I personally decided at the time that my failure was due to the fatigue of a VERY long day of puzzling. This weighed heavily on my mind - I know "she" says I have a tiny mind but things still weigh heavily on it! I tried to find out more about them but only Allard had written anything. I tried to get my own copy and they seemed only to be available from Mine's store in Japan and it seemed very hard to get them over here. So I gave up and puzzled away on other things for a while. Subsequently I met Satomi Beattie at a later MPP and being Japanese, she was able to obtain puzzles for us from her home country. In fact now she runs an eBay store with lots of goodies for you to buy (including these beauties). I asked her whether she could obtain these for me and wonderfully the answer was yes! A month or so later at the next MPP, some petty cash was handed over and they were Mine, mine, mine!!! I got them home, rushed them passed the present Mrs S and then had a play! 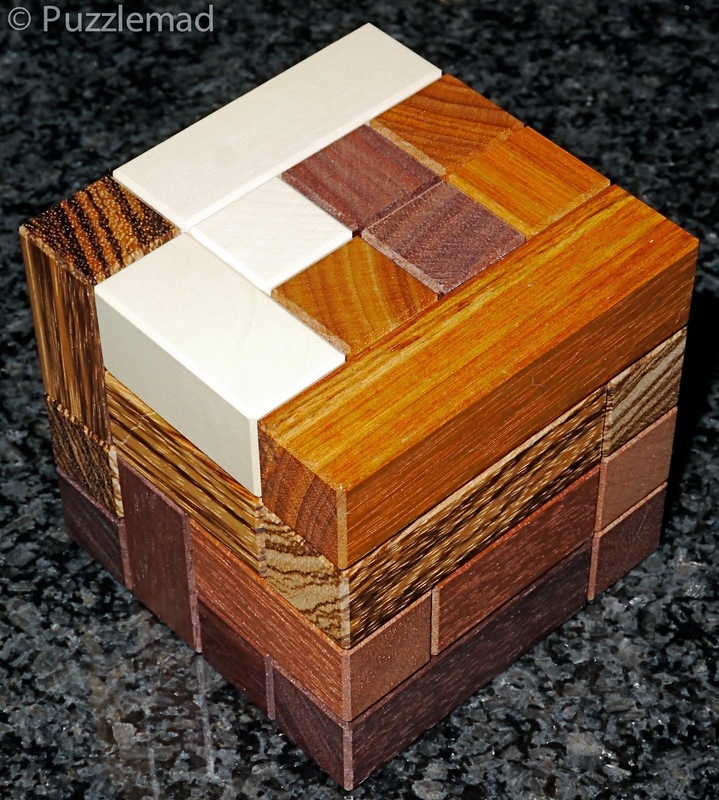 Both the puzzles are beautifully made from Katsura Kojiro and Maple and come in a nice green card box like many Japanese puzzle boxes. They are a bit smaller than the version by Eric but definitely look good on my shelves. 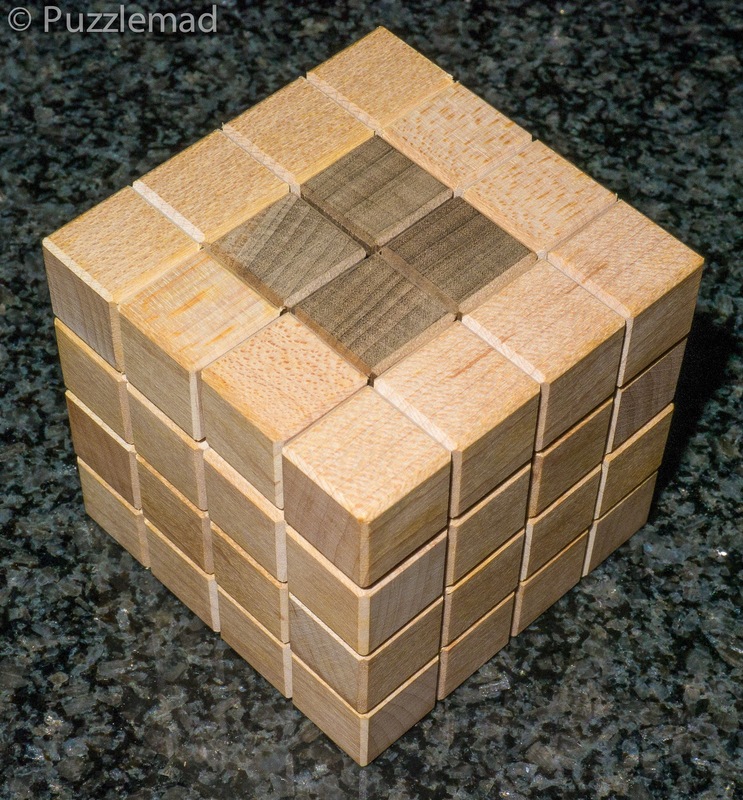 Like the Disjointed cube, it seems to consist of a central core and circular pieces that surround it and which can move varying amounts in different directions but nothing would release a piece. I even took notes and tried to be systematic and move in any directions and try all other moves - all to no avail. Then...... after over a year of owning the little suckers.... (BLUSH!) my lightbulb moment forced me to try something new, something that had not occurred to me before. No, I didn't X-Ray it, I held it up to the light! No I was not losing my mind and NO! it was not transparent. But it gave me a tiny little clue. 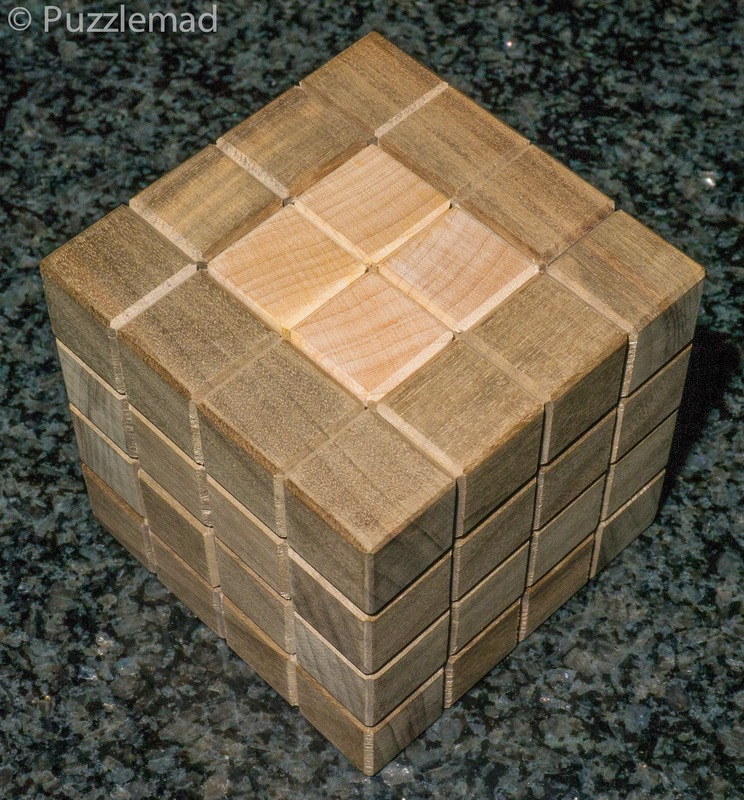 This sneaky little cube had a very unexpected trick which I had never dreamed of - the guys at the MPP who knew about it and who also knew I was struggling never let on, damn them, they left me clueless for over a year! Even then, it was not straightforward - I managed a new move but finding the next still proved tough. After another half an hour it had fallen! Looks easy? I've not shown the secret! and the same trick worked! Thank goodness for that! Finding the subsequent moves was considerably harder but I like to think I'm quite good at interlocking puzzles now and it finally fell! 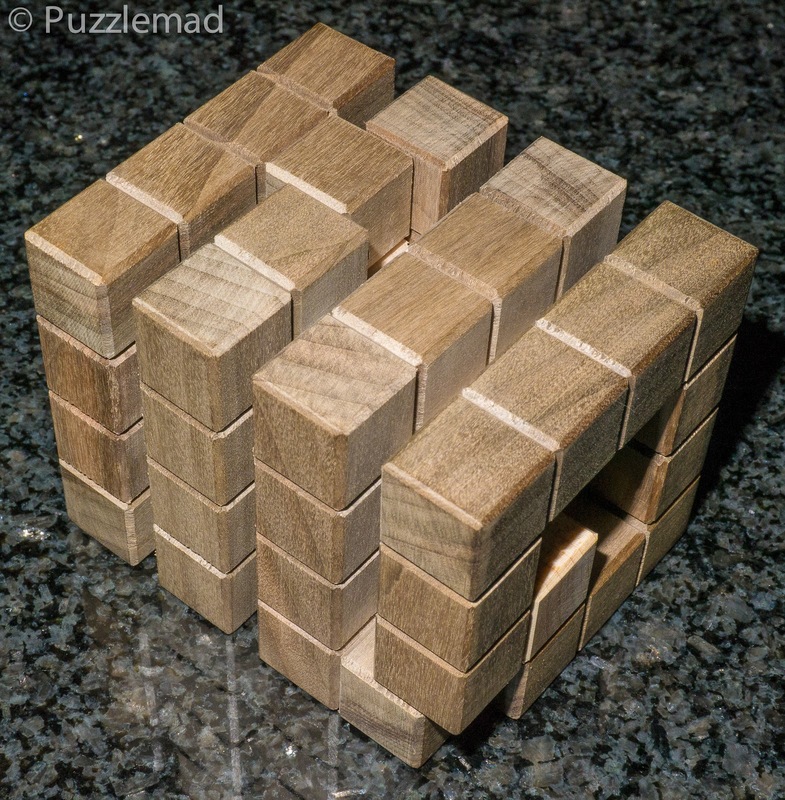 Finally solved Mine's set of cubes - after more than a year! If you attend MPP then have a chat with Satomi about getting them for you. Nice try George! Glad you approve! I got lost in the catacombs as well as the KCube!